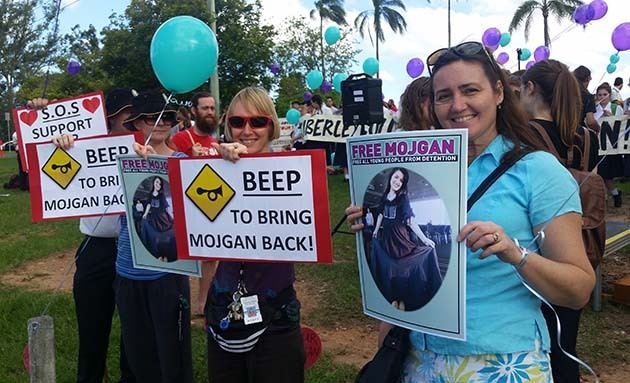 In a wonderful show of solidarity, staff at Brisbane’s Yeronga State High School walked off the job yesterday in support of asylum seeker and student Mojgan Shamsalipoor, currently detained in the Darwin Immigration Detention centre. 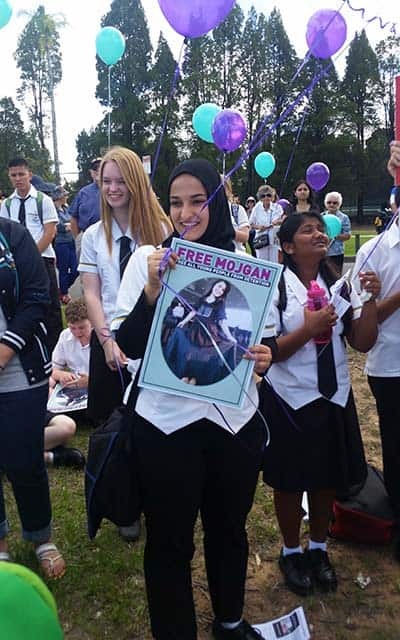 The strike coincided with what would have been Mojgan’s graduation day, had she not been forcibly transferred to detention in Darwin in August, just months before she was set to finish Year 12. 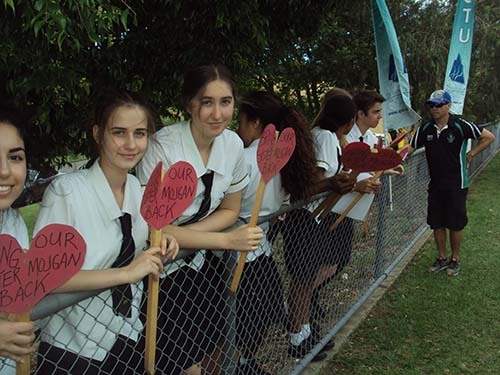 While the hour long stop work meeting was in progress, students at the school staged a sit-in, before moving over the road together for a community rally in a local park. The school Parents and Citizens Association supported the action and spoke at the rally. Support letters from around the country were read out, including from the NSW Teachers Federation, teachers from the Chatswood Intensive English Centre in Sydney and the Sydney University branch of the NTEU. To a great cheer it was also announced that teachers at an Intensive English Learning School in Adelaide were standing on the footpath outside their school supporting the campaign. The school community is frustrated with Immigration Minister Peter Dutton’s lack of response. They are demanding he lift the statutory bar and allow Mojgan to apply for a spouse visa from within Australia. “We have not heard any news so it is important to be proactive”, said union representative Jessica Watson. “We have sent letters to minister Dutton and our new PM, contacted MPs and held rallies and marches, had interviews with many different media publications, collected and submitted signatures on petitions—we now need to consider other action to draw attention to Mojgan’s story”. 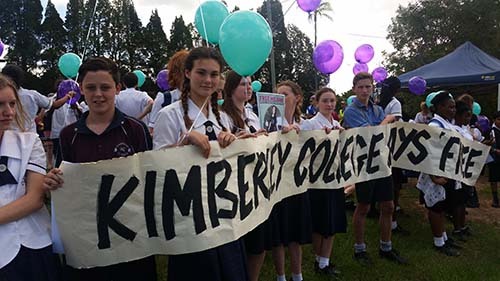 The Queensland Teachers Union fully backed the action recommending, “It would be great if as many members as possible could attend to support the gathering”. QTU President Kevin Bates and Vice President Sam Pidgon both addressed the rally. State Labor MP Mark Bailey also spoke, and the government turned a blind eye to the teachers’ illegal stopwork action. Mojgan fled Iran as a teenager in 2012 after suffering sexual abuse and an attempt to force her into a marriage with a man in his 60s. She was living in the community on a bridging visa while her application for asylum was assessed. She met her now husband, Milad, at Milpera state school before they both transferred to Yeronga. Milad’s application for asylum was successful and he is now an Australian permanent resident. Mojgan’s claim for asylum was rejected so she was forced back into detention away from her husband, friends and school. The Australian government can only send her back to Iran if she agrees to return voluntarily. She now faces indefinite detention in an effort to pressure her to “voluntarily” return. There are close to 50 asylum seekers (mainly Iranians) locked up in Australian detention centres in similar circumstances. Mojgan will face danger if she returns to Iran. Politicians over the years in their attempt to “secure the borders” have stacked the process against asylum seekers. Statements from politicians, too, demonising Iranians as “economic migrants” have corrupted the process. While it was the plight of one asylum seeker that galvanized the school community into action, they understand that it’s the government’s cruel system of deterrence that is the source of the problem. At the stop work meeting the teachers moved a resolution supporting the establishment of an online petition, calling on the federal government to develop more, “compassionate, caring and equitable processes for people seeking asylum”. The teachers’ strike shows the strategic importance of the unions for the refugee rights movement. Both their power to force change through industrial action and their social weight, with the ability to take the campaign into schools and workplaces across the country, makes a difference. Yeronga staff were inspired by the campaign of health professions who have staged protests at hospitals around the country and vowed to defy the Border Force Act, threatening not to discharge asylum seekers back into detention. And now the Yeronga staff, students and parents are an inspiration for others.